ISLAMABAD, Pakistan (CNN) -- Abdul Qadeer Khan, the Pakistani scientist who admitted leaking nuclear secrets to North Korea, Iran and Libya and then recanted his confession, has been released from house arrest after it was declared illegal by the Islamabad High Court, his attorney told CNN Friday. 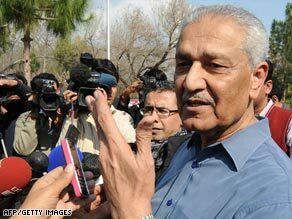 Pakistani scientist Abdul Qadeer Khan meets the media outside his residence Friday. "What the court declared is that he is a free citizen which means effectively... the basic human rights are available to him like any other citizen," said attorney Syed Ali Zafar. The Pakistani government was slow to acknowledge the high court's ruling. A spokesman said the Interior Ministry hasn't received the official court ruling, but will comply with whatever decision was made. Government attorneys said they expected an official announcement to be made by Saturday. But evidence of the end of Khan's house arrest seemed clear outside his home in an upscale part of Islamabad. Where a government security detail previously stood guard with machine guns, cars were parked and reporters roamed the area scratching for details. Khan made a brief appearance, saying he was outside because of the court's ruling, but gave few other details. In Washington, Secretary of State Hillary Clinton said she is "very much concerned" about Khan's release. Separately, acting deputy State Department spokesman Gordon Duguid said: "This man remains a serious proliferation risk.," he said. "The proliferation support that Khan and his associates provided to Iran and North Korea has had a harmful impact ... on international security and will for years to come." Khan is widely regarded as a hero in Pakistan for his part in helping the country to develop nuclear weapons. In 2004, Khan was placed under house arrest following his admission on Pakistan television that he had been involved in a clandestine international network selling nuclear weapons technology from Pakistan to a host of nations including Iran and North Korea. "Even if they had asked me I wouldn't have answered," he said last year. In May 2008, Khan denied his involvement with the spread of nuclear arms outside Pakistan. He explained in an interview with ABC News that the Pakistani government and then-President Pervez Musharraf forced him to be a "scapegoat" for the "national interest." He also denies ever traveling to Iran or Libya and said that North Korea's nuclear program was well advanced before his visit.